Many sword-dances of Northern England are preceeded by what is termed a Calling-on song, which is sung unacompanied. 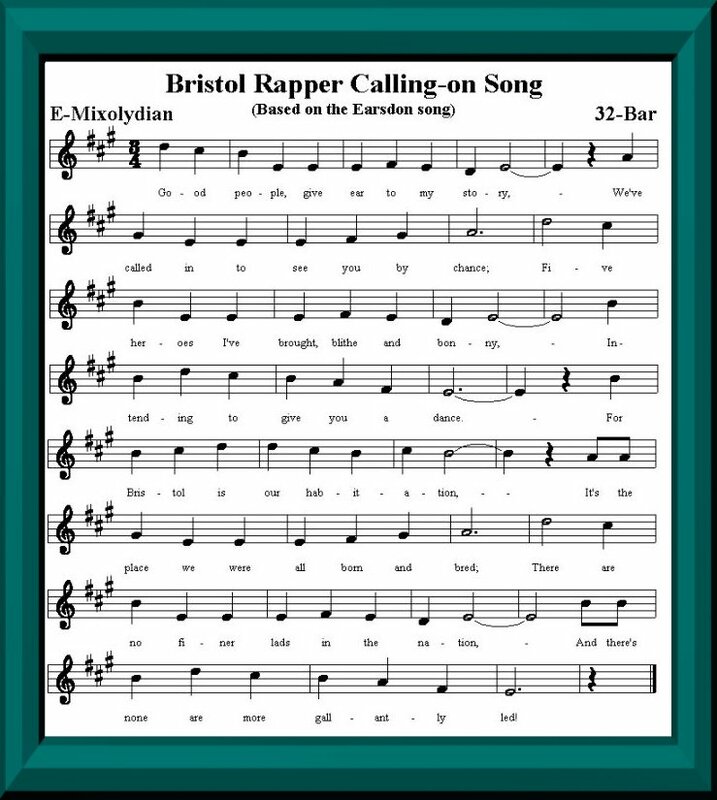 The song used by Bristol Rapper is based on the one from the village of Earsdon. In the song, the dancers are introduced as being the "sons" of famous military men, namely: the sons of (1) Lord Heathfield Elliot, (2) Admiral Lord Duncan, (3) Admiral Lord Nelson, (4) the Duke of Wellington and (5) Napoleon Bonaparte respectively. Surprisingly, only one the above was actually English, namely Nelson (born in Norfolk). The Duke of Wellington is thought of as being English, but he was born in Dublin, Ireland. Elliot and Duncan were both Scottish. Napoleon was of course French, and the arch-enemy of Britain as well! Although interesting, the song is rather long and chant-like, and probably not suitable for performance to most modern audiences. However, Grant Glanville (the captain of Bristol Rapper) always likes to sing it if he gets the chance (although we usually try to dissuade him!) As a compromise, he will sometimes just sing the first, second and last verses - or just the first and last verses. And there's none are more gallantly led! To welcome the incoming year. Their fathers were all heroes of old! That he fought for his country and King. Some died, others fled in disgrace! And defeated the fleet of the Dutch. And fled off to that great Dogger Bank! And scarce one got off home for to tell! He'd conquer or else he would die. Made the nations to quiver and quake. At the havoc he always did make. As any such heroes on earth. To see how they handle their swords!